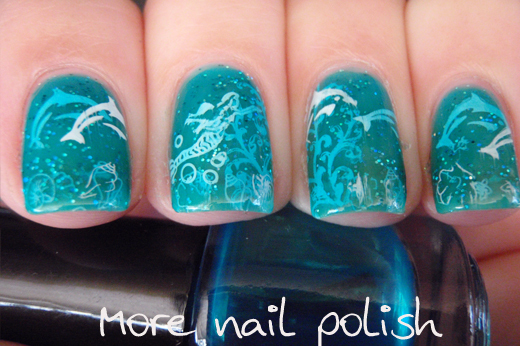 Have you guys seen this totally awesome 3D design using jelly polishes? It inspired me to create my own 3D design. The light reflections on these photos make them a little hard to make out, but this is what I did. I started with a single layer of China Glaze Atlantis just for a bit of sparkle. I then applied a layer of top coat and a layer of a teal blue jelly polish I made up using blue tinter and suspension base. Next I stamped a seaweed plant across the my middle and ring fingers, and I also stamped some sea shells along the french tip. I then applied top coat, and another layer of the jelly polish. I then stamped a dolphin on my index and ring finger, a few more shells and then another layer of top coat and jelly polish. 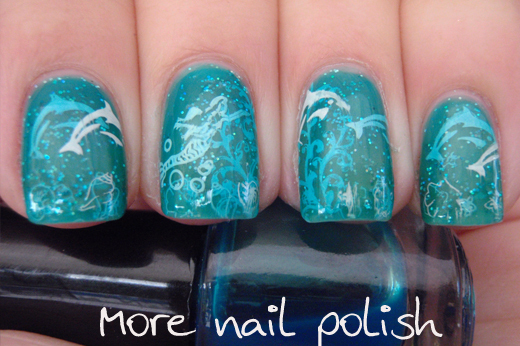 Then I did the mermaid stamp and another dolphin, more top coat more jelly coat. Lastly a finished with one or two dolphins and top coat. In the end there was about 10 layers, but to make this work well, you really have to use some layers to get the depth. This last picture is at a bit of a weird angle, but it has the least light reflections and you can see the layering the best. I like this idea, and need to try it again. One of the coolest and most innovative nail design techniques I have ever seen! Amazing! Very unusual! 10 layers of polish, wow, it is impressive as well (: But the result is totally worth it! Thank you so much for the inspiration! Ooh it's soooo gorgeous, and you know how I am about teal!! <3. I am surprised it ever dried with all those layers! This is a great mani. Yes, I can see the depth and it really is 3D. 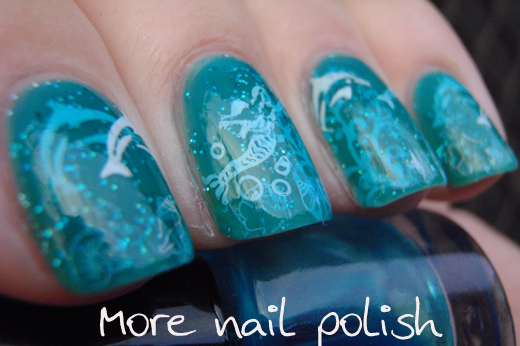 Perfect for summer with the sea theme. I love mermaids. That is what my hubs calls me, his little mermaid. (I love bubble baths too hence the nickname from him). Wow this is soooo great!! I have a very jelly blue polish that I might use for this :) What is the source of the flower 3d nail art? This is soo gorgeous!!! Must Try! What a nice new take of the original nailart! I love the theme and you've executed it so well =) Bravo! This just oozes fabulous! It sounds like a lot of work, but what a satisfying result. Did you have any problems with it drying? Oh my! this is crazily beautiful and creative!! well done! Wow, this looks beautiful, so much depth! I so fishing love this ! !